Standardization of methods for measuring the electrical conductivity (EC) of composts to determine soluble salts is one recommendation of a new report from the Composting Council Research & Education Foundation (CCREF) and researchers from the University of Wisconsin Oshkosh. The new report, published on January 15, also recommends that the labeling of composts with high concentrations of soluble salts should be standardized and include an Ag Index to inform consumers of the nutrient content and potential risks if improperly used. CCREF said compost contains a multitude of essential nutrients for plant growth, such as nitrogen (N), phosphorus (P) and potassium (K), and can also be a source of organic matter. However, recent concerns and criticisms have been directed toward composts with a high concentration of soluble salts. Soluble salts refer to the amount of soluble ions, such as calcium (Ca2+), potassium (K+), magnesium (Mg2+) and sodium (Na+), present in compost. Soluble salts are measured indirectly and cumulatively through electrical conductivity. To bring clarity to this concern, CCREF, working with researchers from the University of Wisconsin Oshkosh, created an in-depth report looking at the question of soluble salt concentrations in compost. The report provides a literature review of soluble salt concentrations present in compost and the effects of applying composts with high concentrations of soluble salts on plant growth and soil. The methods of analysis used in preparing the report included searching and evaluating published scientific articles, books and grey literature. Keywords used in this literature search included: compost, salinity, electrical conductivity, soil amendment, salt tolerance and phytotoxicity. Eighty published sources were used in the analysis, of which 69 were scientific articles, three were books and eight grey literature. By evaluating these sources, a holistic perspective of the benefits and issues surrounding high soluble salt concentrations in compost was formed. The presence of high concentrations of soluble salts in growing media can lead to phytotoxic effects. The most common soluble salt responsible for these effects is NaCl. Good quality composts have limited amounts of Na+ and Cl- in them, and therefore, should not cause the phytotoxic effects that have been described, as long as they are properly applied. Compost can serve as a critical source of nutrients, as it can have significant concentrations of phosphorus, potassium, calcium, magnesium, and sulfate, which can either be readily absorbed by the plant or be transformed by enzymatic activity to readily available forms. Compost products can provide the essential micronutrients for plant growth and a significant source of organic matter. The literature suggests that the application of compost with high EC5 values and limited NaCl concentration will not induce negative effects as long as the soils they are applied to do not exceed an overall ECe of 4 dSm-1 after application. If the ECe does exceed 4 dSm-1, then it is recommended that the soil be irrigated to leach excessive salts. As well, composts should not be limited to an EC5 value of 5 dSm-1 or less. The literature suggests that the application of composts with high EC5 values can be beneficial to plant growth and yields when properly applied. However, if not properly applied and/or managed, the applications of these composts to soil could result in a negative impact on seedlings and plant growth. Further scientific study examining how overall ECe of soil mixed with composts with high EC5 impacts plant growth is needed. Measurement of EC values for soils and composts needs to be standardized. 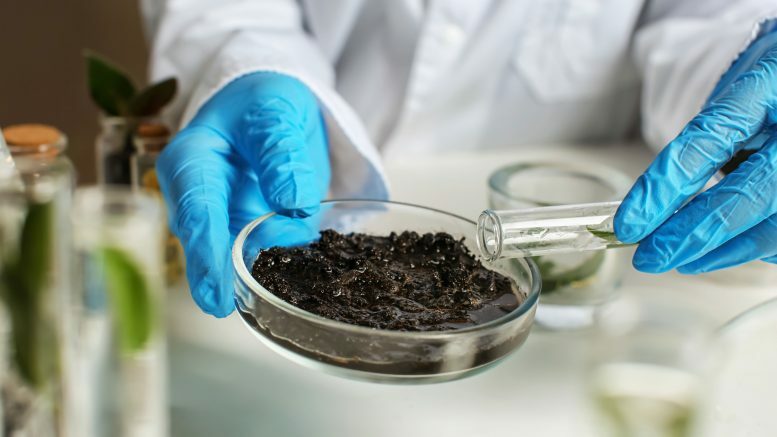 This standardization can be in the form of Seal of Testing Assurance (STA) guidelines for laboratories doing compost analysis through that program. Methods for measuring the EC of composts be standardized so that more literature regarding EC in compost can be compared and used for scientific reasoning. Composts should not be limited to an EC5 of 5 dSm-1 because of their ability to remediate saline-sodic soils and serve as a significant source of essential plant nutrients. The labeling of composts with high concentrations of soluble salts should be standardized and include an Ag Index to inform consumers of the nutrient content and potential risks if improperly used. Regional and local soil management strategies for compost application should be developed with the variability of soil type, plants being grown, availability of irrigation, and environmental impacts in mind. Further research is needed to evaluate the different mixtures and proportions of soluble salts present in compost and their effects on plant growth. A summary of the findings and the full report can be found on the CCREF website. The report is available free of charge. Be the first to comment on "Study suggests standardized measurements for soluble salts in compost"